In order to have more than one product image, eBay requires your images to be uploaded to their servers (EPS). While the free version isn't able to upload images to EPS and therefore can only use one product image, WP-Lister Pro allows you to upload all your product images from WooCommerce to eBay, where they will show up as thumbnails below the main image and will benefit from eBay gallery features like zoom. After updating your listing profile, you'll have to revise your changed listings to submit your changes to eBay. You might wonder why it's not enabled by default, and the answer is simple: We believe that our customers should be able to switch from the Lite to the Pro version (and vice versa) seamlessly, without having to worry about anything that would suddenly change on their listings. 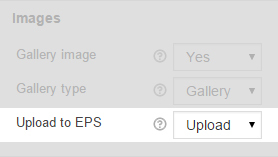 So even though Upload to EPS seems like something everybody would want to have, you still have to activate it after upgrading to WP-Lister Pro. If the gallery images still don’t show and you see some error messages about failed uploads or "ExternalPictureURL server not available" you might have to fix your SSL configuration or change the EPS Transfer Mode option to "Active". For more details see Image URLs, SSL and eBay.